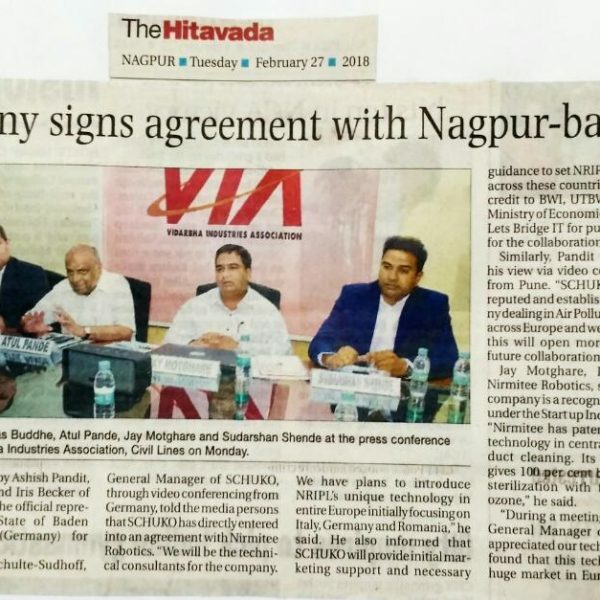 German Corporate signs agreement with Nagpur start up - Nirmitee Robotics India Pvt Ltd. during the German Delegation visit to Nagpur. Lets Bridge IT, official representatives of State of Baden Wurttemberg (Germany) for Maharashtra, conceptualized, designed and managed a visit to Nagpur by a German Delegation. It comprising of Founders & Owners of 11 SME companies in the sector of Air Pollution/Water/Wastewater Management, Baden-Württemberg International (BWI), Umwelttechnik (UTBW), Ministry of Economic Affairs representatives from the State of Baden-Württemberg and representatives of the City of Karlsruhe. This visit on 31st Jan and 1st Feb was planned, managed and executed by Lets Bridge IT in association with Vidarbha Industries Association (VIA). This 27-member delegation was led by Dr. Frank Mentrup, Lord Mayor of Karlsruhe. The key feature of this visit was the focused business-to-business interactions between the German visiting companies and like-minded businesses from Nagpur. 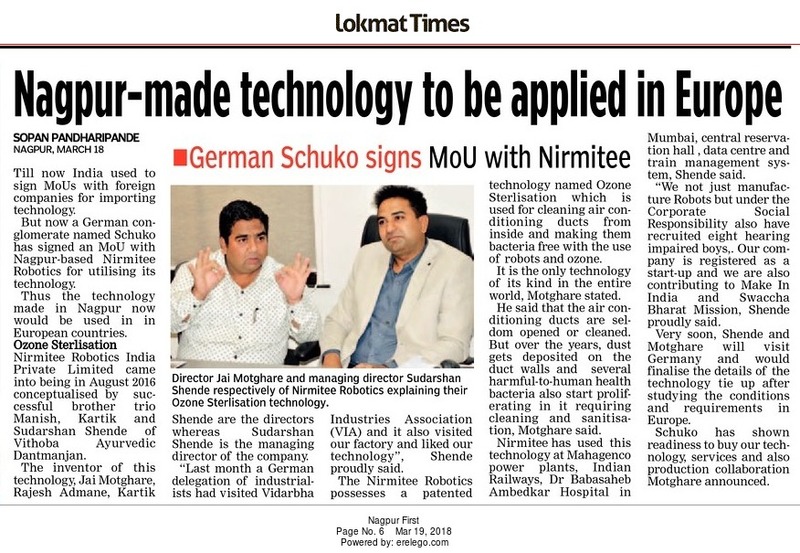 The positive outcome of the visit was the technology transfer agreement between the Nagpur based start-up (Nirmitee Robotics -NRIPL) and an established German company SCHUKO Bad Saulgau GmbH & Co. where the German company will focus on promoting the indigenous technology in the European Market. 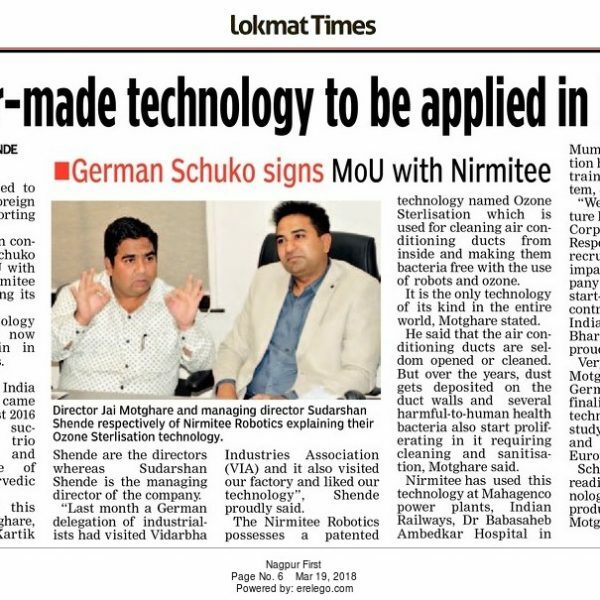 Mr. Andre Schulte-Sudhoff, General Manager of SCHUKO informed that SCHUKO has directly entered into an agreement with Nirmitee Robotics India Pvt Ltd. and will be the Technical consultants for NRIPL. His company plans to introduce NRIPL’s unique technology in entire Europe initially focusing on Italy, Germany and Romania. He also informed that SCHUKO will provide initial marketing support and necessary guidance to set NRIPL’s business across these countries. He gave credit to BWI, UTBW, The State Ministry of Economic Affairs and Lets Bridge IT for making this feasible. Mr. Jay Motghare, Director at Nirmitee Robotics India Pvt Ltd (NRIPL) shared that Nirmitee Robotics India is a recognised start up under the Start up India Initiative. 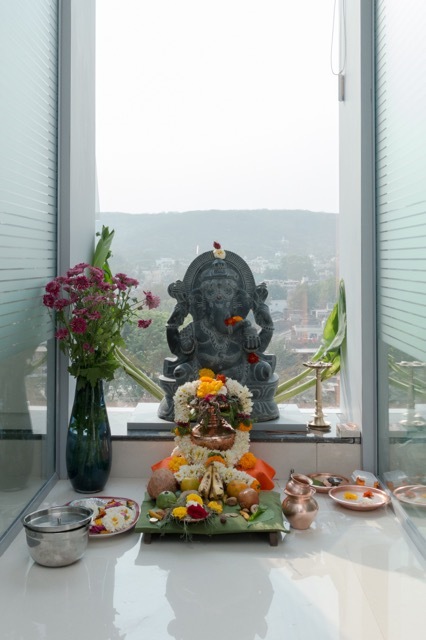 Nirmitee has patented unique technology in centralised HVAC duct cleaning. NRIPL technology gives 100% bacteria free sterilization with the help of ozone. During the business at VIA, the General manager of SCHUKO appreciated our technology, and found that this technology has huge market, long term business, repetitive business as well as the work itself has social touch. Within 24 hours our meeting, we had signed a Letter of Intent with the German company. This technology has been already used for key Indian businesses like the Indian Railways, Thermal Power Stations, Hospitals, Hotels etc. Jay also thanked Lets Bridge IT for continued support in making this deal happen. He was also thankful to VIA for giving him an opportunity for developing business across Europe. This deal news got extensive coverage in the English Language and Local Language press along with the TV coverage. This deals was also covered in the Industrial Product Review Magazine in its March 2018 edition, this magazine has a coverage of over 30,000 readers across India.